It is no secret that I like snacks. I love to much on things, particularly popcorn. Bonus points for sweet popcorn. So while the rest of my office quickly tires of the tins of popcorn that show up from clients around the holidays, I am overjoyed, and eagerly devour the neglected tins. 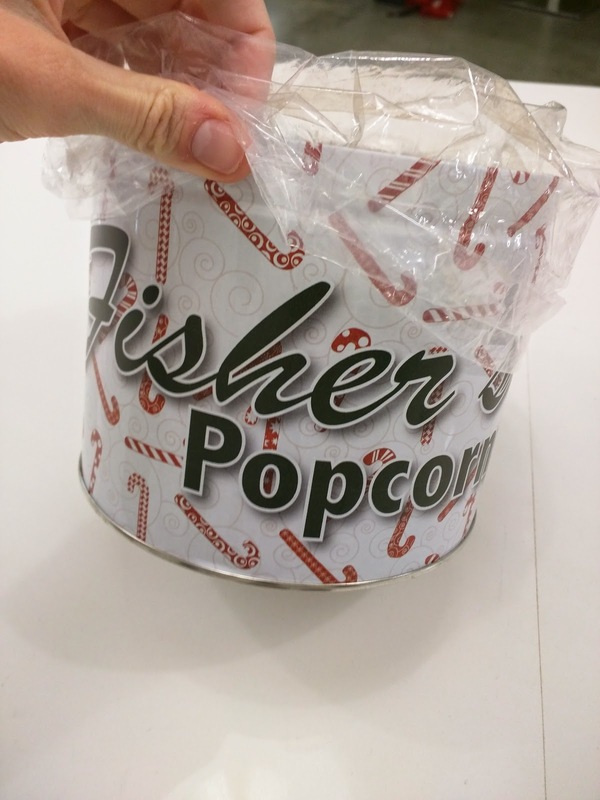 1/2 Gallon Fisher's Popcorn. $12. Fisher's is a small family business in Ocean City, MD. They've been making popcorn, and specializing in caramel corn, since 1937. They make a slew of other flavors, including a savory Old Bay flavor, and an Old Bay caramel corn, which I think sounds more fascinating than actually tasty. I tried the classic caramel corn. It was super sticky, and many of the kernels stuck together in clumps or mini popcorn balls. I don't consider this a bad thing necessarily, but it definitely made for sticky fingers. The popcorn wasn't crispy, so it almost seemed a bit stale, but there was so much caramel that it didn't really matter. I appreciated how well coated the kernels were. Like most caramel corn, it got even better when I froze it, as it got crispier. 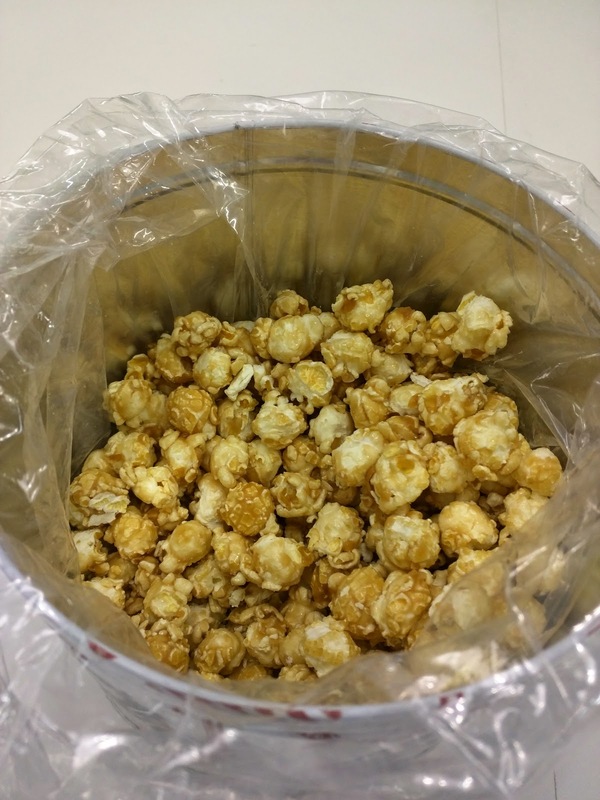 I'm still partial to the caramel corn I get from Munchery, but I did quite enjoy this, and would gladly consume more. A while ago, I attended an event catered by Bamboo Asia. The food was far better than I expected, so I decided to return to the physical store to give it another chance. As I mentioned in my previous review, I've actually been before, but everything looked so unappealing that I left without trying anything. 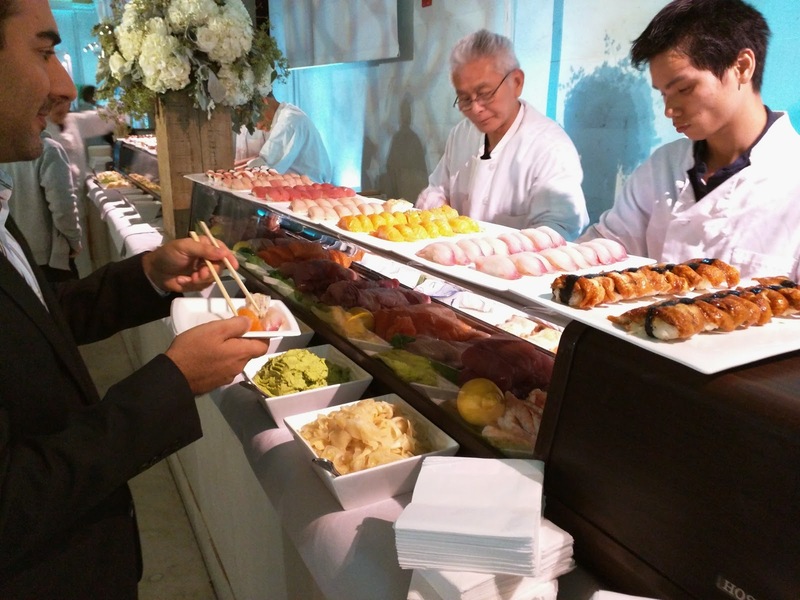 But if Bamboo Asia can pull off decent catering, I decided perhaps looks were deceiving. Bamboo Asia offers 3 cuisines: Vietnamese, Indian, and Japanese. Each occupies its own distinct section of the store, in a layout that is a bit confusing at first, as they each has its own line to order and its own register. I'm not sure what would happen if you wanted a Vietnamese spring roll and a Japanese mochi dessert ... would you have to go through both lines and pay separately? At the catered event, I tried dishes from the Vietnamese and Indian parts of the menu, so this time, I went Japanese to start. I still wasn't feeling brave enough to get the sushi, so I just went for sides and dessert ... because I'm willing to try dessert just about anywhere. It turns out, I should have listened to my initial impressions and instincts. The food wasn't good. The staff was completely un-organized, rang people up for the wrong items, prepared orders for dine-in that were to-go, etc. That said, the worker who prepared my little bowl of seaweed salad was very friendly, and even told me he gave me "a little extra". Aww, thanks! And, they accept PayPal mobile as payment, which is my new favorite way to pay on my phone these days. But ... I don't think I'll be returning. 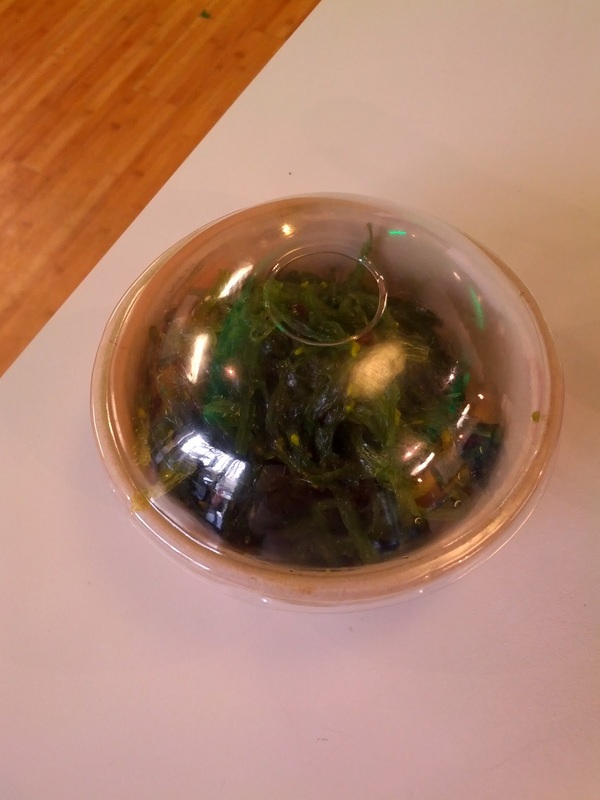 I was really craving seaweed salad. When I ordered it, the guy fetched a big bag full out of the fridge, cut it open, and dished me up some. Clearly, not something they make fresh in store, but I still had hope. It wasn't good. Yes, there were multiple types of seaweed. There was light sauce. There were sesame seeds. But ... something just tasted quite off. I can't put my finger on it, but it really just wasn't a good flavor. $2.95 is a fine price for a small side salad, although places like Onigilly offer it for only $1.84, where it is actually good. 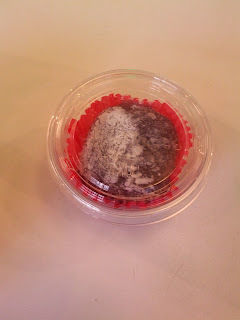 I wanted to satisfy my sweet tooth too, so I grabbed a mochi at last minute, also from the Japanese area. Some pieces were labelled with the flavor, some weren't. I asked what kind this was, and the person behind the counter didn't know. I hoped it was taro, based on the slightly purplish color, but alas, I think it was red bean. It was unremarkable mochi. Soft-ish, not much flavor. I'm guessing they don't make their own mochi either. Meh. I wanted another dessert, since I wasn't into the mochi. This one came from the Indian section, the only other choice that day, labeled "Anjou's Laddo". I'm not really sure who Anjou is. And actually, I wasn't familiar with laddoo, but ... dessert! Laddoo is apparently an Indian sweet, almost like a cookie. I really wanted to like it. The spicing was good, predominately cardamom. 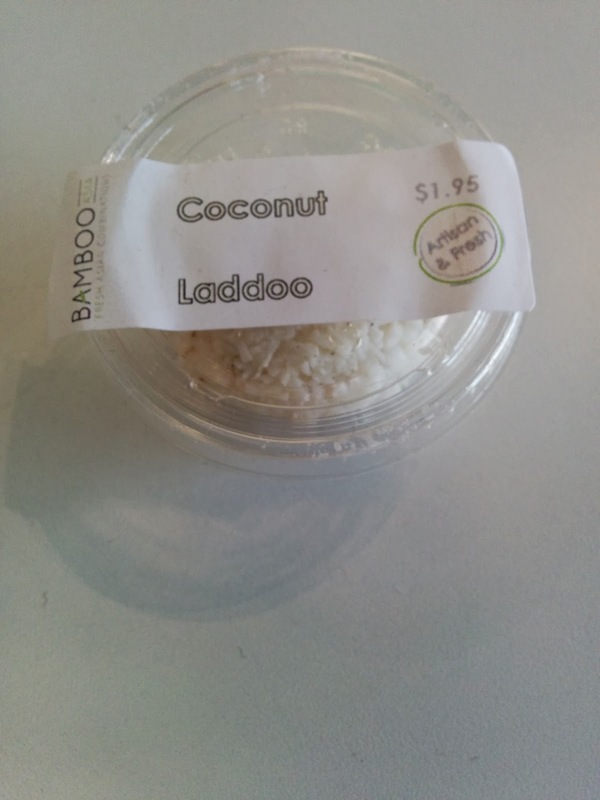 But the item itself was basically just a dry ball of coconut. Like a macaroon, but not moist. It offered nothing. I wouldn't get again. This post has been consolidated into my other Virgin America First Class reviews. Please go read it there instead! Every year, they do entirely different menus. Two years ago, it was downright incredible. One room at the venue was a special seafood room, where they served seared scallops that rivaled those of most restaurants. Using their tiny little catering facilities. I honestly have no idea how they pulled it off, but I was absolutely blown away. 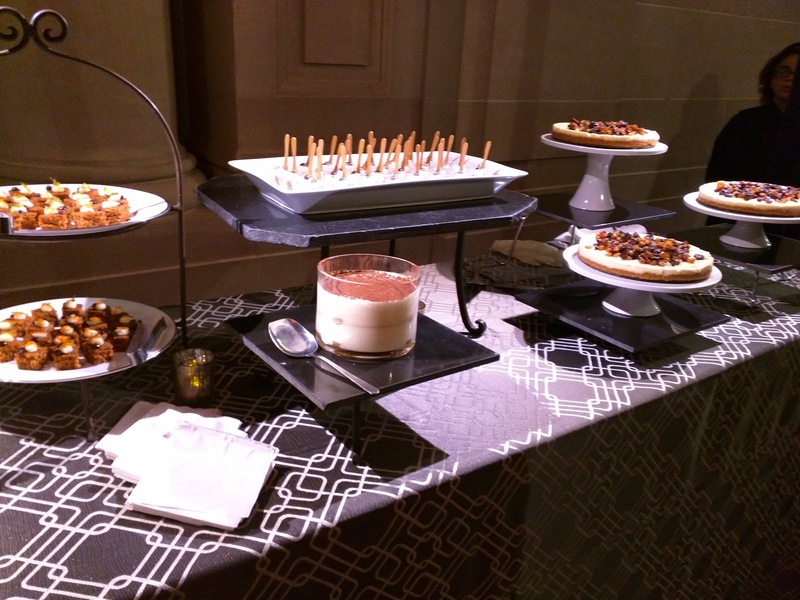 They also always set up a dessert room, and many of the items featured there have been particularly notable. Of course, I never took photos or notes before, so I don't have any real details to share on my past events. So this year, when I heard that Melons was catering our party again, I was excited. I took photos. I was ready to write a glowing blog post. But ... there was little to glow about with the main food options. Some of it was menu choice, as there was no extravagant seafood room this year (although there was a sushi bar, which was decent), but mostly, the hot food just really wasn't good, and perhaps most tragically, the desserts were all lackluster as well. I was excited to walk in to the first room and discover a whole charcuterie table. The perfect place to start, particularly alongside my glass of mediocre red wine, and the lineup was quite impressive. Melons cures all of the meat in house, using products from Stone Valley Farms. 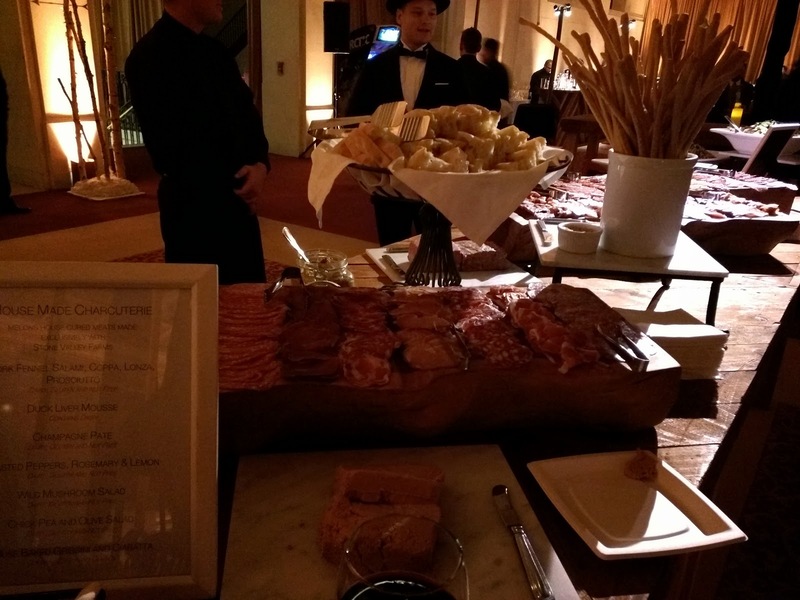 There were several salami-style items that were all fine, including pork fennel salami, coppa, lonza, and prosciutto. The prosciutto was the most memorable, and I genuinely enjoyed it, particularly slathered with a little mustard, of which there were several choices. But the star of the lineup was the duck liver mousse (and not just because it reminded me of foie gras!). It had the perfect consistency and flavor, not too livery. I went back many times throughout the night for more and more of this. Once I tried all of the desserts, and was not satisfied by any, I may or may not have come back for more of the mousse as my quasi-dessert. Winning item of the night. The charcuterie station was completed by housemade focaccia and breadsticks, wild mushroom salad, chick pea and olive salad, and roasted peppers, none of which I tried. The next room we entered featured a sushi bar. Now this looked promising, particularly given how much I enjoyed the seafood offerings the previous year, it seemed possible that they would have decent quality product. 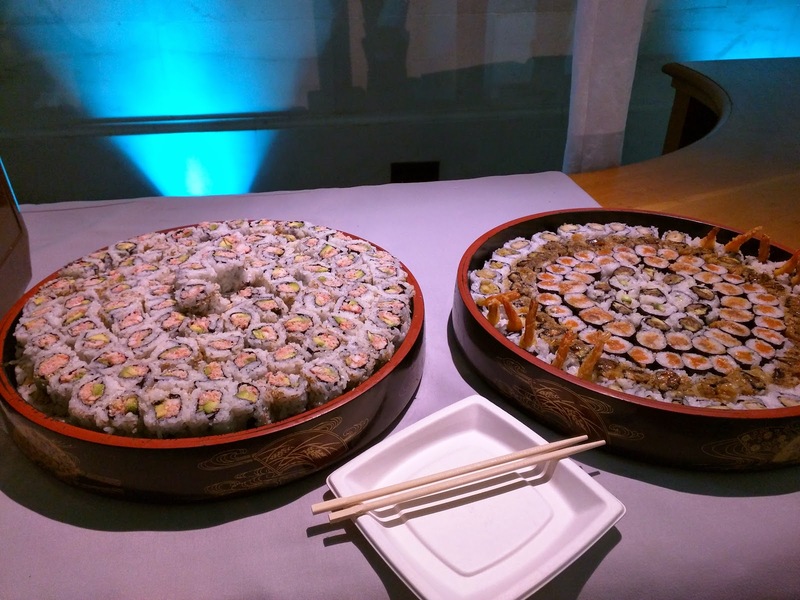 But, catering sushi? The shelf life of sushi is on the order of minutes, how could they possibly do sushi hours before and have it be good? They couldn't and knew that, so the sushi was actually being prepared behind the bar by a line of chefs, it hadn't been sitting around for hours. There was a decent line up of nigiri including unagi, hamachi, salmon, octopus, and two types of tuna. I tried all but the unagi, and they were all fine, not incredible obviously, but good enough, and the product was decent quality. However, the fish was a bit warm. They obviously weren't in a climate controlled area, and were working with what they had, but there is something off putting about warm fish, and it certainly changed the texture. The sushi was served with wasabi, ginger, and soy sauce, as you'd hope, but there were no dipping cups for the soy sauce, so you had to dump soy sauce on each piece of fish from the big vat as you served yourself, and this just didn't work well. But for massive party catering? Not bad. There were also pre-made sushi rolls. One entire tray was California rolls, which turned out to be a good thing. Of all the sushi, it turned out to be my favorite, it tasted fairly fresh, and wasn't overly coated in mayo or anything. The other platter contained a mix of spicy tuna, unagi, tempura shrimp, and veggie rolls. The spicy tuna was also tasty enough, but the fish was a somewhat grey color, which scared me a bit. 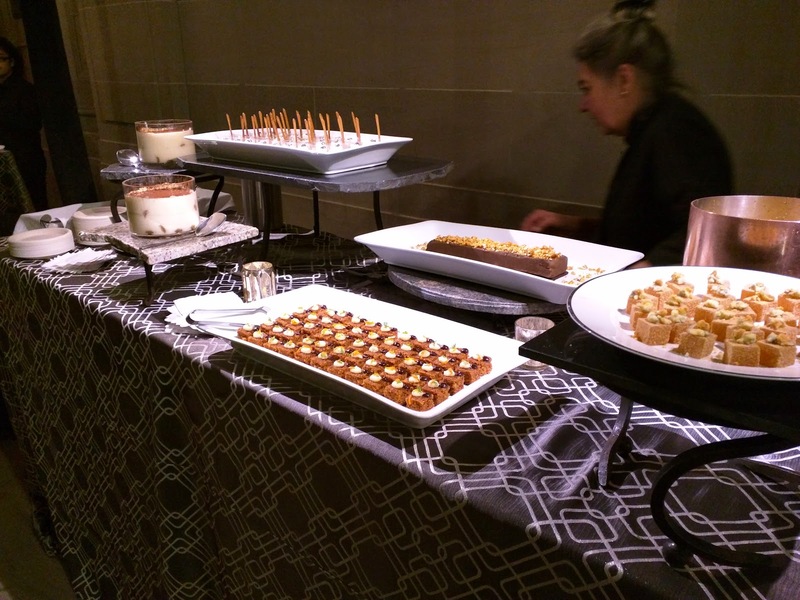 There were also two themed buffets: Italian or French. I somehow lost the photos. The buffets annoyed me. They were buffets, but, you couldn't serve yourself, instead, they had staff there to add items to your plate. I wanted to try a little bit of everything, but it was impossible to communicate that I truly just wanted a little dollop of each dish so I could try everything, and then come back for more of something if I liked it. No matter what language I used, I got giant scoops of everything. The French offerings had two salads, a good enough basic frisee salad with nicely crispy bacon bits (and an optional poached egg), and a fairly tasty celery root and carrot slaw. Hard to go wrong with bacon and mayonnaise. The hot offerings were not as successful. The gratin potatoes were completely undercooked and basically raw, so even large amounts of cream and cheese couldn't save them. The beef looked dried out and awful, so I didn't even try it, and I never like quiche, so I skipped that too. I was sad, since I love French cuisine, and there was potential here, but there weren't even delicious sauces to try! The menu for the Italian section was no better. The main entrees were pork and rock cod, both of which I actively dislike (seriously, you want to hear me rant sometime ... ask me about rock cod. I don't think it is possible for rock cod to be tasty). I also skipped the fried stuffed olives, since they clearly weren't freshly fried. Since it was an Italian station, it obviously had pasta, and I did try those. The first had rubbery baby shrimp in a vary banal red sauce. Meh. The other was a vegetarian option, that just tasted really strange, and was crazy mushy. I didn't want to finish a single bite of this, not even for exploratory purposes. The buffets were clearly not the way to go, and after the awful pasta and the undercooked gratin, I was too disheartened to try anything else, and just went back to the sushi and charcuterie to eat enough "real food" that I could move on to dessert. As I mentioned, the previous years always had impressive dessert rooms. While I am fairly picky about food, dessert is the area where my standards do lower. Enough cream, butter, and sugar and I'm generally happy enough. But ... nothing here came close to satisfying. On the left is carrot cake bites. They were fairly dry and flavorless, topped with a tiny insufficient dollop of cream cheese frosting. Seriously, carrot cake is ALL about cream cheese frosting, who thinks that a dot of it is enough? Next was tiramisu, that clearly didn't set right. As it was spooned onto my place it ran all over the place like melted ice cream. I didn't mind the runnyness exactly, except that it also didn't taste like anything. No mascarpone flavor, no coffee flavor, nothing. Just runny whiteness. In the back were tiny espresso panna cotta. Panna cotta is always a favorite of mine. This had a good consistency unlike the poor tiramisu, and it was topped with good enough whipped cream, and did taste a little like espresso, so, it wasn't bad, but it also wasn't particularly good. The best was cheesecake, with a sweet, buttery, crunchy crust, and a creamy interior. It was topped with booze stewed dried fruits, which I wasn't a fan of, but the cheesecake itself was decent. Not earth shattering, and I wasn't even tempted to get a second piece, but, good enough. There was also a pear pâte de fruit, topped with a dollop of cheese and a nut, which I skipped. Yes, gasp, I skipped a dessert. And last, a chocolate gateau. It had a mediocre base chocolate cake layer and a decently creamy chocolate pudding layer. It was served with a sauce they ladled over the top, that was cloyingly sweet. Like, unpalatable sweet. And I like sweet! The sauce also had little chunks of banana, which were quite good, but I didn't understand the sauce at all. I'm normally a sauce girl, and a fan of having a hot component with my dessert, but this just didn't make any sense. Last year's dessert lineup was much, much better, as there were multiple items that I couldn't stop going back for more and more of, and this year, I didn't bother with seconds of anything. The Nestlé empire is rather insane. They have 8,000 brands ranging from baby food to frozen food and basically everything in-between If you start paying attention, you'd be shocked to see how many companies are owned by Nestlé. Tasting notes: The notes I wrote described this as "crispy crunchy caramely peanut buttery center" coated with milk chocolate. I was a bit blown away when I later read their description on the website, and it was a near-match! The filling was a really unnatural orange color. It was all low quality, but a pretty tasty combo. "The classic peanut butter cup was missing something…until now. The combination of creamy milk chocolate, smooth peanut butter and the perfect dose of BUTTERFINGER took the cup to a whole ‘nother level." My first thought was, "woah, they make peanut butter cups?" My next thought, as I opened the package was, "where is the outer wrapper?" 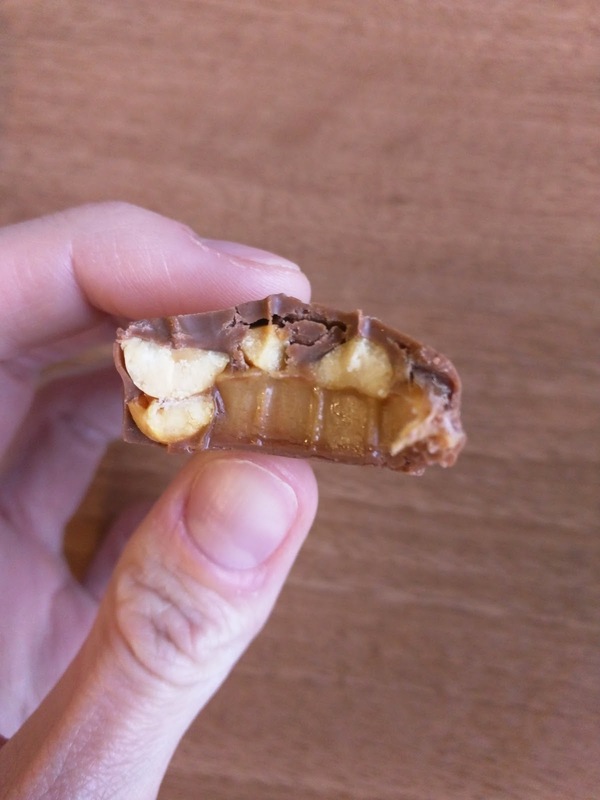 as it was naked inside the package, like pretty much any other candy bar, but for some reason, Reece's has trained me to expect a wrapper. And very quickly, all those thoughts were replaced with, "what? Square? You can't have a square cup!" So clearly, I went into this with expectations. 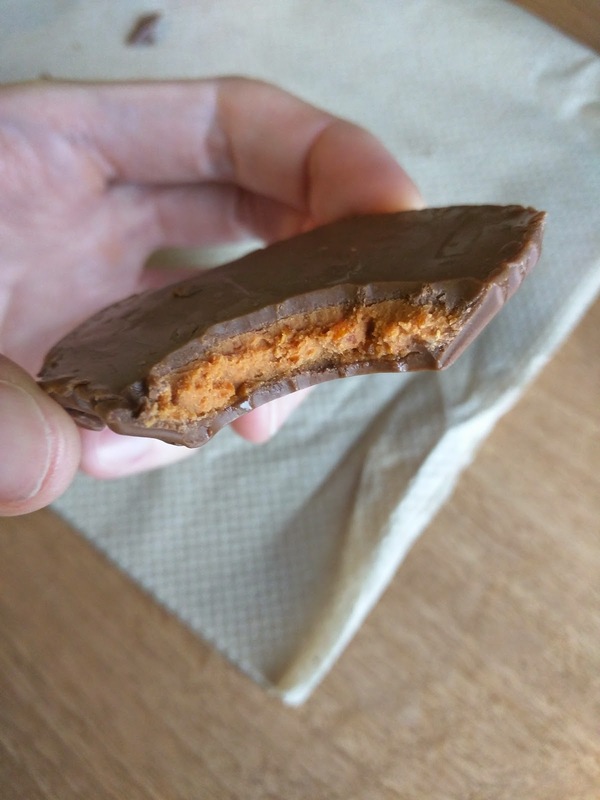 Butterfinger Peanut Butter Cup: Inside. The milk chocolate was mild and very creamy. 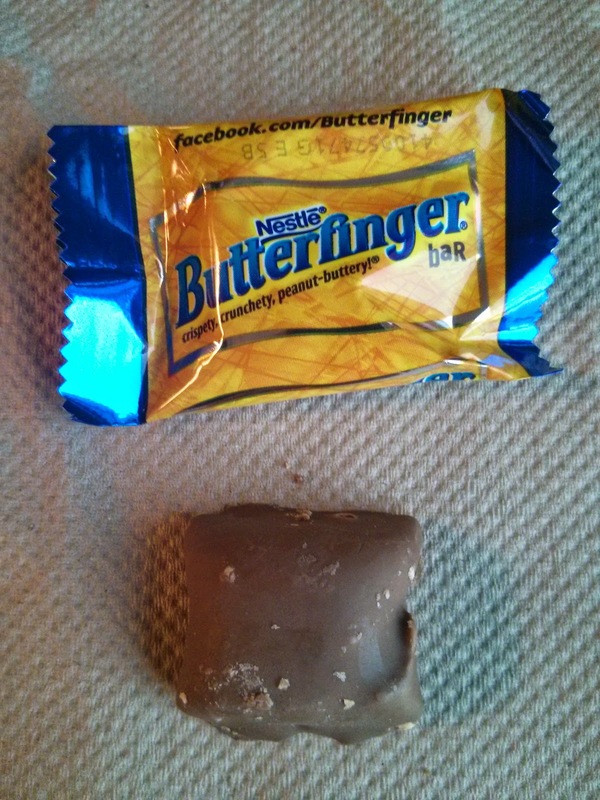 The inside was brighter orange than a regular peanut butter, more like, well, a butterfinger. The filling was a bit like crunchy peanut butter, and I liked the texture, but it didn't have enough peanut butter taste for my liking. 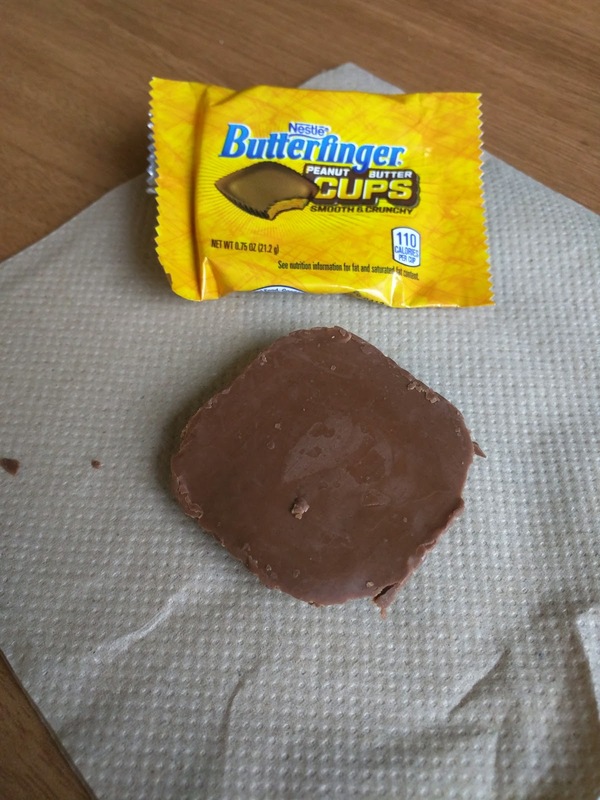 Sorry, but I prefer a regular pb cup, or a regular Butterfinger, but I do see what they are going for here. I still don't know why it was square ... with rounded corners, very 2.0 of it. Tasting notes: chocolate/caramel flavored nougat (the soft, slightly chewy kind) makes up most of the bar, topped with a VERY thin layer of thicker caramel, then layer of peanuts, covered in milk chocolate. Decent combination of textures, but the is caramel barely noticeable, and it is made from clearly low quality nuts and chocolate. One bar I tried had no nougat! It was just thick caramel, peanuts, and chocolate coating. 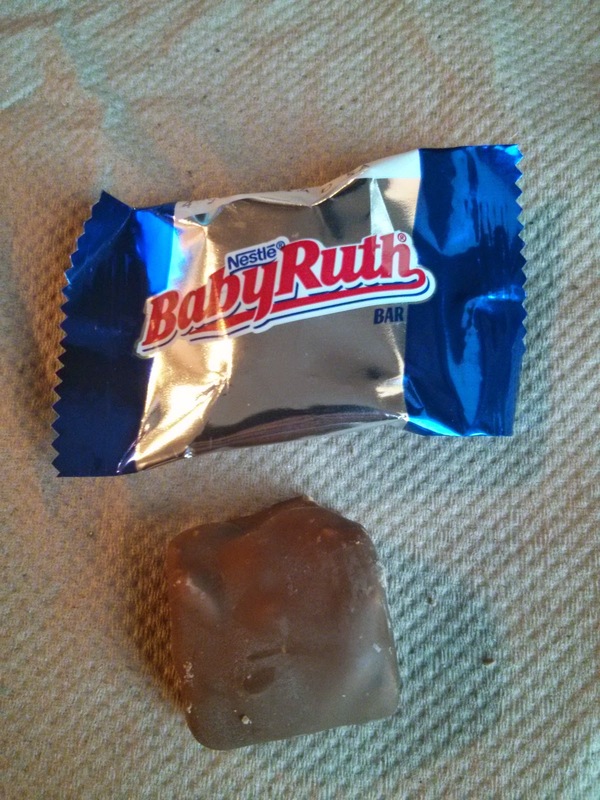 The peanuts and chocolate were nice enough, and the caramel had a nice chew, but, this didn't seem quite right. 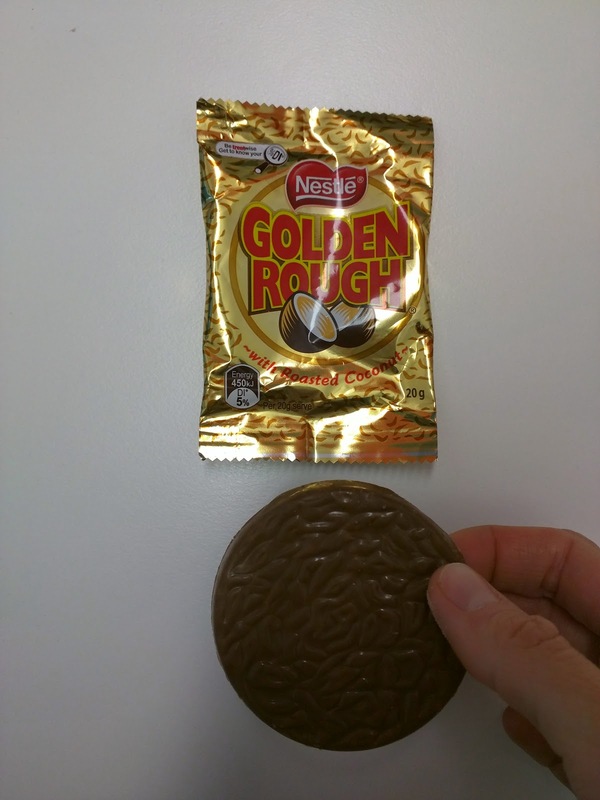 This is from their Australian division, a chocolate disk with coconut flakes. The chocolate was just cheap milk chocolate, studded with lots of coconut flakes. I didn't really care for this, even though I wanted to like it, because I do like both chocolate and coconut. Bit-O-Honey: Tasting notes: sweet, not very flavorful. Didn't really think it represented "honey" very well. Nestlé Crunch: "Creamy milk chocolate and light airy crispies". Tasting notes: Is the chocolate actually "creamy"? No. Is the chocolate good at all? No. But I do enjoy the crunch!